Healthcare facilities are designed to enhance a hospital staff’s ability to provide high-quality care and efficiency. Yet the power of the architecture itself to impact a patient’s recovery time and the overall effectiveness of a facility tends to be overlooked. The new term “healing architecture” indicates that the built environment has the ability to impact patients’ health and psychological well-being. Features such as bright rooms, access to natural daylight, big windows, local plant life and outdoor views can improve the healing process by giving patients a psychological and physical lift. What is healing architecture or healing environments? Healing architecture for healthcare facilities describes a physical setting that supports patients and families through the stresses that develop as a result of illness, hospitalization, medical visits, the healing process or bereavement. The concept implies that the physical healthcare environment can make a difference in how quickly patients recover or adapt to specific acute and chronic conditions. Eliminate environmental stressors, such as noise, lack of privacy, poor air quality and glare. Connect patients to nature by providing outdoor views and other natural features, including interior gardens and water elements. Enhance the patient’s feeling of being in control by offering options and choices – these may include privacy versus socialization, lighting level, type of music and quiet versus active waiting areas. Encourage opportunities for social support, such as providing appropriate seating in patient rooms, privacy for small groups and overnight accommodations in patient rooms. Provide positive distractions, such as interactive art, fireplaces, aquariums, internet connection, music, or soothing video or light installations suited to the healthcare setting. Inspire feelings of peace, hope, reflection and spiritual connection. 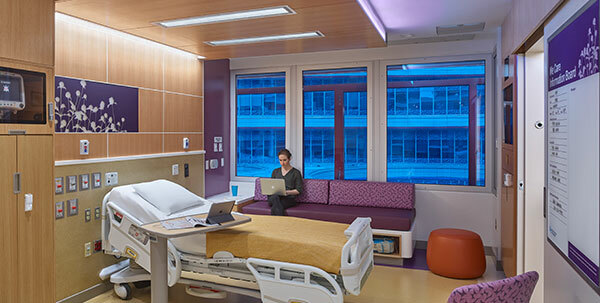 Recent examples have shown how thoughtful architecture and design focused on promoting healing can have a measurable impact on patient recovery, including shorter hospital stays, fewer infections contracted in the hospital and reduced pain. Research by Dr. Roger Ulrich, a professor of architecture at the Center for Healthcare Building Research at Chalmers University of Technology in Sweden, found that gallbladder surgery patients assigned to a room with a window view of a natural setting had shorter postoperative hospital stays as compared to patients in similar rooms with windows facing a brick building wall. Similar research by the Department of Neuropsychiatric Sciences at the University of Milan found that patients with bipolar disorder assigned to brighter, east-facing rooms with morning sunlight had hospital stays nearly four days shorter than those with west-facing rooms. According to a study by the Environmental Design Research Association, during the weeks that posters of realistic nature scenes were hung in the multipurpose lounge of an acute psychiatric clinic, the administration of “as-needed” injections to manage patients who exhibit “aggressive and agitated” behavior was 70 percent lower than when the walls were blank. These results also apply and are even improved when patients are in contact with actual views of nature. Healing architecture can also encompass strategies intended to reduce the spread of infection. A recent trend in the healthcare industry is to grade hospitals based on the likelihood of a patient incurring an infection in the facility that is different from the medical issue for which the patient was admitted. According to The Leapfrog Group, an independent nonprofit committed to pursuing quality, safety and transparency in the U.S. healthcare system, 1 out of every 25 patients develops an infection while in a hospital. Healing architecture starts with a focus on improving the patient experience and outcome. In order to bring healing architecture to life in healthcare facilities, it’s important to adopt a holistic planning approach that includes input and feedback from the end users in addition to the design, construction and operations teams. At Karolinska University Hospital in Sweden, an architect redesigned the neonatal ICU to accommodate a strategic shift in care protocol. Only after working alongside the daily staff to understand the needs the new protocol would require was he able to design a new hospital unit that would lead to improved results. After implementation, the hospital reported shorter hospital stays – including stays 10 days shorter for the most premature infants – lower morbidity rates, fewer infants requiring ventilator assistance and improved long-term mental and physical prospects. By controlling sunlight to optimize daylight, dynamic glass eliminates glare, one of the environmental stressors that healing architecture aims to remove. In doing so, the indoor environment becomes more comfortable for patients, visitors and hospital employees alike. With SageGlass dynamic glass, shades or blinds are not required to eliminate the sun’s glare, which gives patients and their families unobstructed views of the outdoors and comfortable levels of natural light all at the same time. According to several studies, views of the natural world have been linked to faster patient recovery rates, decreased dependence on medication and improved emotional wellness. According to the session “Natural Light for All: An Effort to Bring Daylight and Views to Healthcare,” presented by architects and design experts at Greenbuild 2012, natural daylight has been proven to have a direct and positive biological impact by helping to modulate a patient’s circadian rhythm to improve alertness and reduce depression. Daylight also promotes the production of vitamin D, which supports heart health and bone growth. SageGlass is in the process of conducting research at a hospital in Philadelphia, Pennsylvania, to provide additional insight into how access to natural daylighting via dynamic glass can improve the patient experience as compared to patients in rooms with low-e glass and interior blinds without access to optimized natural daylighting. Dynamic glass can also contribute to a more sterile patient environment. Traditional windows that require shades or blinds can attract dust and germs and need to be cleaned and sanitized by hospital staff – a drain on employee resources. Without the need for shades, dynamic glass windows are easier to access, clean and maintain. Furthermore, since users can override the tint of SageGlass via a wall switch or the SageGlass mobile app, patients and their families are in control of the amount of daylighting. If you are interested in learning more about how SageGlass can help improve the patient recovery process, visit our products page to learn more about our dynamic glass or contact us for more information.